Students waited hours to vote and longtime voters were turned away by the state’s new photo ID law. Milwaukee—Dennis Hatten voted in Wisconsin yesterday, but it wasn’t easy for him, or thousands of other voters. Hatten spent months trying to get a voter ID and then had to make multiple trips to the polls to vote. 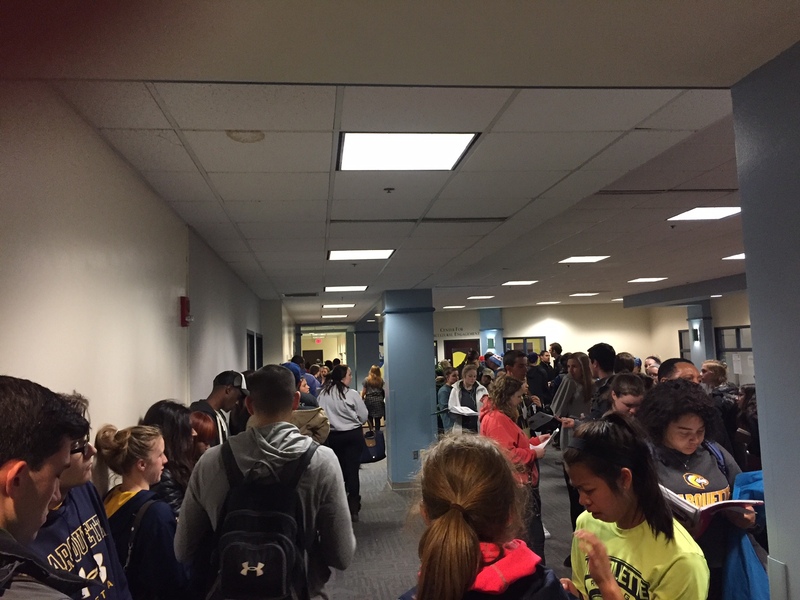 Meanwhile, students waited hours to cast a ballot at Marquette, in addition to long waits at University of Wisconsin-Milwaukee and University of Wisconsin–Green Bay. Others left the polls because of the long lines or didn’t get to vote because of the voter-ID law. Hatten, a 53-year-old African-American man, moved to Wisconsin from Illinois in 2013 after losing his job as a powder coater. A veteran of the Marines, he relocated to Milwaukee to seek help from the VA hospital, which put him up in temporary housing while he was homeless. 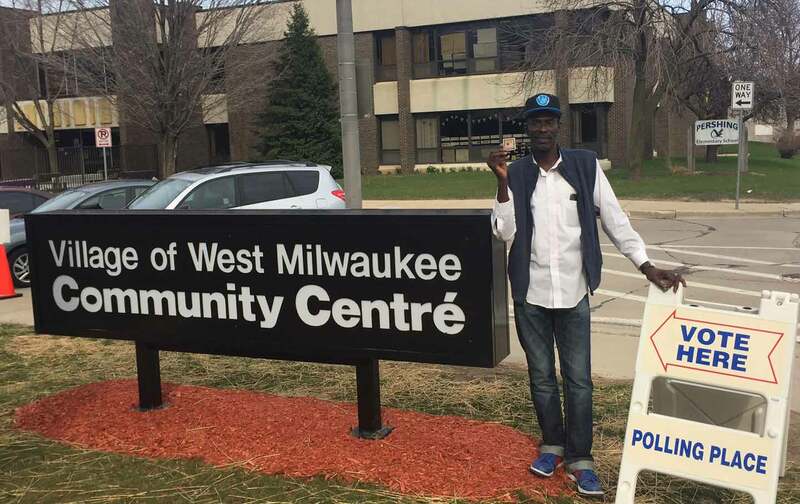 He wanted to vote in Wisconsin, but his Illinois driver’s license was not accepted under the state’s strict voter-ID law, nor was his veteran’s ID at the time. In August of 2015, he met Anita Johnson, Wisconsin coordinator of VoteRiders, who helped him try to get a photo ID for voting in Wisconsin. It became a bureaucratic nightmare. The DMV rejected Hatten’s application for a free ID because he didn’t have a birth certificate. After Johnson resubmitted his hospital and birth records, the DMV said the birthdate didn’t match. Finally, Johnson discovered that Hatten was delivered by a French midwife in Arkansas, who spelled his name D’Nette instead of Dennis, but the DMV said Hatten would need to change his name through the Social Security Administration to get an ID for voting. After a lengthy back-and-forth with the DMV, Johnson discovered that Hatten had used the name D’Nette when he first applied for a Social Security card, which allowed the DMV to finally verify his identify and issue Hatten a state photo ID. “If Dennis didn’t have someone to advocate for him, he would have given up,” Johnson said. His Election Day experience didn’t go much more smoothly. Hatten brought his state photo ID with him to the polls, but the address on it didn’t match the address of his new apartment, which the poll workers needed to register him at his new polling site. While he was conferring with the poll worker, another man who tried to register and vote with his veteran’s ID, which does not contain an address, was turned away from the polls. Hatten left the polling site, retrieved a utility bill with his new address, and returned a second time to vote. This time he was able to cast a ballot. It took six months for him to get a photo ID for voting, two trips to the polls and an hour to vote. “I’ve never had any problems voting until I came to Wisconsin,” he said. His story is both inspiring and infuriating, and clearly illustrates the burdens associated with the state’s voter ID law. Not everyone had Hatten’s perseverance. VoteRiders tried to help as many as possible get photo IDs for voting, but there were still people like Nancy Anderson of Green Bay, who is disabled and in a wheelchair, and was not able to make it to the DMV to get a photo ID and then to the polls on Election Day in time to vote. I wrote last week about longtime voters like 89-year-old Ruthelle Frank who cannot afford or obtain the underlying documents to get a valid voter ID. After following Hatten, I went to the polling place at Marquette University in downtown Milwaukee, where more than 150 students were waiting to register and vote in a two-hour line at the Alumni Center. Scott Walker attended Marquette, before dropping out, and his son is currently at the school. Student IDs for most universities are not accepted by the Wisconsin legislature, so schools like Marquette had to print new voter-IDs for students. In addition, students needed to bring proof of address to register and proof of enrollment to vote, which slowed everything down. “I didn’t realize how much the voter-ID law would hinder the voting experience,” said Maggie Stang, a junior international-relations major, who waited two hours and 20 minutes to register and vote. Giulianna Sutkiewicz, a senior at Marquette, voted at the student polling site in the February local elections, but her name was not on the registration rolls when she tried to vote yesterday. The head election official told her to vote in her hometown an hour away or get back in the line at Marquette and wait two hours to re-register, which she eventually did, after retrieving a book to read. Martha Pincus of the League of Women Voters said she observed multiple students at Marquette leave without voting because of the long lines. “They said things like, ‘You talk about voter disenfranchisement, this is what happened here,’ and ‘I skipped one class, I can’t skip another,’” Pincus told me. When the polls closed at 8 pm, there were still 240 students in line. Katherine Murray, a senior, was the last to vote at 9:45, nearly two hours after the polls closed. If Wisconsin did not have Election Day registration, hundreds of students would have been turned away. Despite the high voter turnout, the problems in the primary don’t bode well for what could happen in November, when many more people will vote, there will be more competitive races, and Wisconsin will be a key swing state. “This is the worst election I’ve ever seen in Wisconsin,” Johnson said. Wisconsin Republicans believe the voter-ID law will help them in future elections and have been relentless in restricting voting rights. When asked why Republicans would carry Wisconsin in November, GOP Congressman Glenn Grothman said, “Now we have photo ID.” Tuesday’s primary showed how young voters and voters of color, the core of the Democratic Party’s coalition, are the GOP’s main targets.